The websites above are games that I explored about coordinate grids. I found them to be very useful and engaging. Students love games and love doing things that do not make them feel as though they are learning. However, there are a variety of tools that can be learned form using these games. Students can practice finding coordinates, placing coordinates and learning which is X & Y. The only disadvantage to using online systems is that sometimes glitches happen when an answer is correct. This happened to me and unfortunately students might look at this as discouraging. I would consider using all three websites within my classroom. Many schools are implementing math rounds as a means for enhancing student learning. With this in mind, these websites would be great for a technology round when working on this unit. Presenting students with definitions to begin a lesson and not go further until they are know is setting students up for failure. Definitions can be wordy and sometimes bring forth a variety of misconceptions for students. One of the largest misconceptions is that students would begin to only visualize geometrical shapes in one way. Therefore, when students see the same shape turned sideways or of different sizes it because a challenge for them to break from this view. Instead rather, this teacher should consider creating definitions with students so that they understand the different varieties of shapes rather than one solid definition. 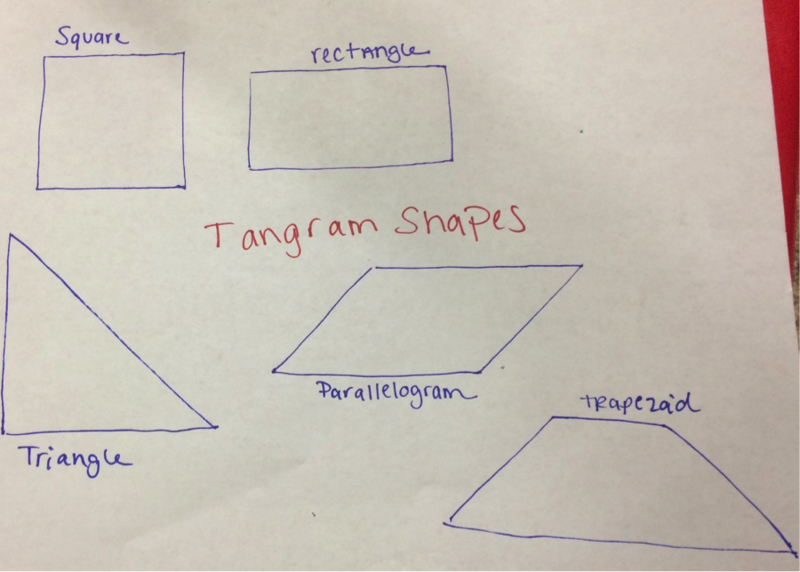 Students need the opportunity to examine shapes and see how they work in different ways. ******How can we avoid these types of misconceptions for our students? 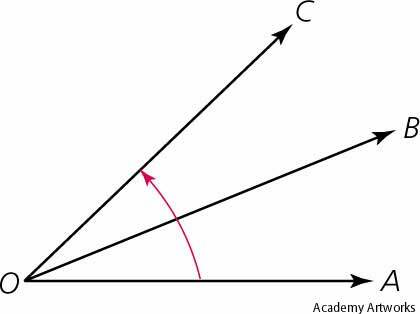 How has your view of the key ideas of geometry that you want your students to work though changed? My view on geometry has changed dramatically after working through these modules. I realize now that I want my students to learn through work rather than definitions. Geometry has a many forms beyond just shapes and I want my students to be able to see that as well. Working with pentominos is a way to see other geometrical shapes put together to create ones that they are familiar with. I also want my students to visualize geometry as a real life concept rather than math only. Using tessellates and patterns can teach students that geometry is everywhere and has been a useful tools for many years. *****How can you implement real world geometry experiences into the classroom? I have discovered a substantial amount of information upon working with the tangram pieces. I have discovered that several shapes can be made from three simple tangram pieces. I also discovered that the big triangles smaller sides are equal to the small triangles large side. With this being said simply by looking and counting the sides of each shape I could determine which shape had the larger perimeter. I found that the square had the smallest perimeter and the triangle shape has the largest perimeter. I also realized after a moment of thought, that the shapes will all have the same area because they were constructed with the same smaller shapes. The passageway below is 17 spaces long. There are no branches, and it is closed. The area of my passage is 17 cubic units. ******What concepts could you apply narrow path creation? I will full admit that I was very frustrated when playing the STACKS scholastic game. I did not understand hope I was supposed to possibly make a rectangle with so many different shaped pieces. I found that my first issue was that I was attempting to created a rectangle that was white in it’s center because of the graph behind it. I then realized that I needed to make a rectangle that was filled in. Once I made that connection, I had a better understanding of what I was supposed to do. This would be a great activity to explore with students, and allow them to do these puzzles as a “finished early” activity. 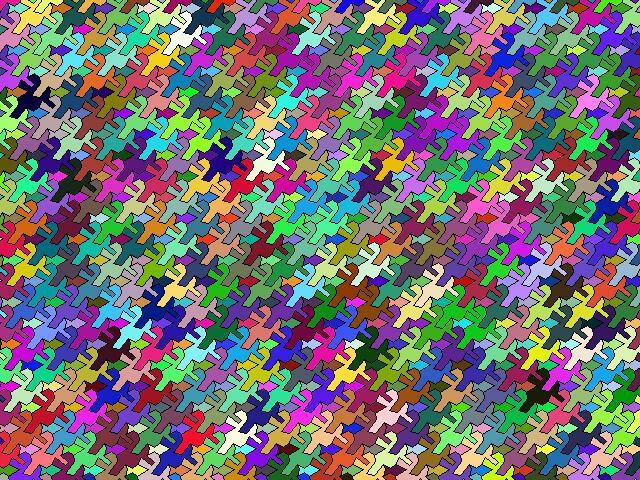 ** I stumbled across this website as I looked for more puzzles. It give several other shapes that can be made from pentominoes! Upon reading Tessellating T-shirts, I learned a variety of ideas about tessellation. I realized that tessellations are a concept that dates back in history and involved the use of geometry in everyday life. This covers art work, potteries and over styles. To tessellate means creating a pattern with a geometrical shape that fits within the same shape over and over across a plane. 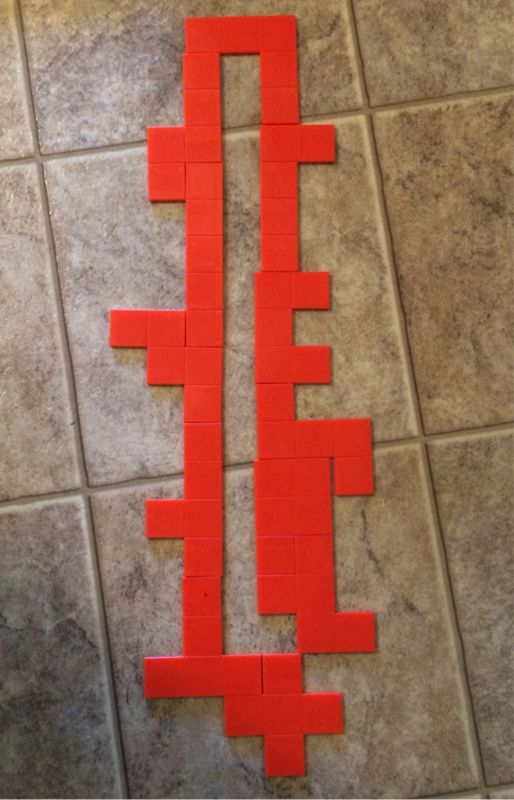 I also learned how tessellates can be introduced through items all around us such as tile floors, ceiling tiles, and brick walls. The article demonstrated how T-shirts could be made with the students to express how a tessellate can be used. Here are a few examples that I found of different types of tessellates. 1. 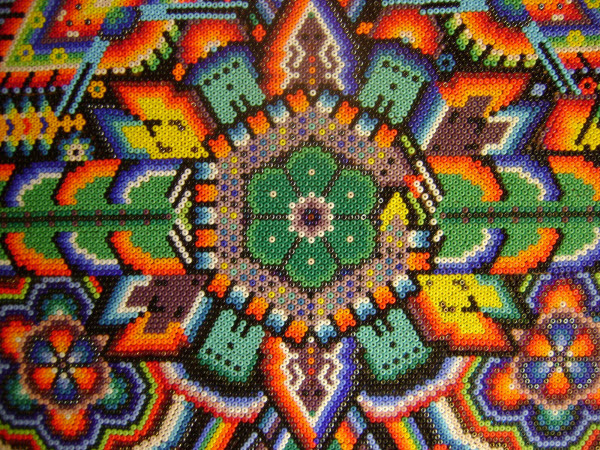 Mexican Ancient Art: This rug offers an opportunity to observe Mexican art history as well as investigate geometry. When we look closely, shapes such as hexagons, pentagons, quadrilaterals and squares can be found. We could use this to determine the types of shapes we see as well as finding area using the “bead like” stitching as a unit of measure. 2. 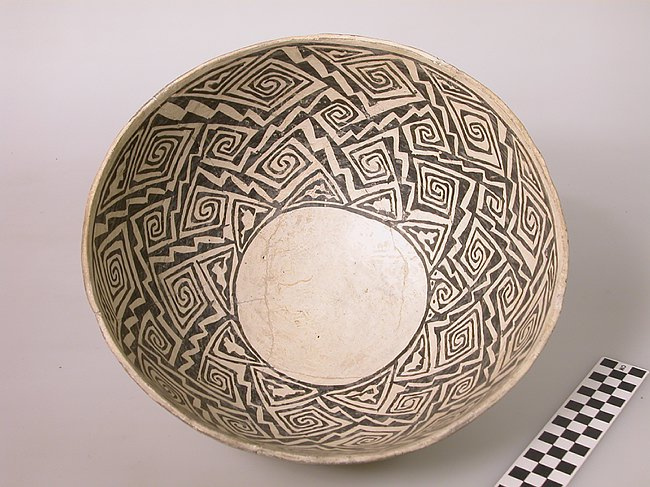 Native American Ancient Art: This bowl is a great example of how geometry was used as a form of art. 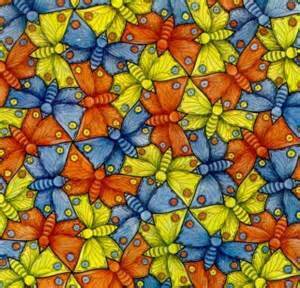 Students could use the repeating of this pattern to determine where or not it is a tessellate or not. The students could also study how this bowl could be changed to meet tessellate features. 3. 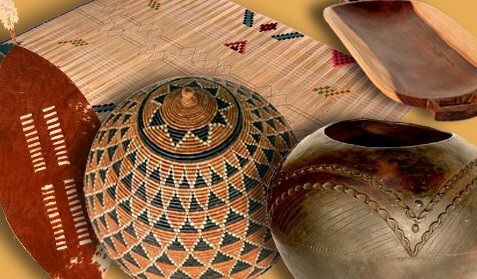 African American Ancient Art: This beaded jar has the opportunity for great study within the classroom. Students could use this to determine surface area using nonstandard measurement and visualizing tessellates in real objects. I think this would be an easy way for students to examine patterns as well. Shockey, T. & Snyder, K. (2007). Engaging pre-service teachers and elementary-age children in transformational geometry: Tessellating t-shirts , Teaching Children Mathematics, 14(2), 82-87. *****Can you see any other ways this art could be used? I could see myself using this activity as an opener or warm-up activity. Using pentominoes seems to be a brain stimulator that could be useful in the beginning of the day. Another fun way to use this activity would be to have students create their own and share them with classmates. When I was completing the activity, I could do some of the pentominoes with ease and others were confusing. I am not much of a visual person; therefore this was hard for me to think outside the box. However, after reading the article I had a little better understanding. Instead of just looking at them, I could process where I should begin. For my students, the only anticipated issue I would have is the fact that some students may have a hard time trying to “mentally” make a cube. The best way for teaching students about pentomioes would be actually cutting out one and showing them how it would fold into a cube. Some students may struggle with visualizing this activity. *******How can we make this activity easier for students to visualize? Did you find any of these activities challenging? If so, what about the activity made it challenging? I did not find any of these activities terribly challenging. The building plan was a very interesting concept for students to work through. This might become a little confusing for students because they may not realize that the goal is to not just fill into the cubes but must be stacked as well. I also think spatial reasoning can come a little challenging for students who to use there brain as a planning tool. Why is it important that students become proficient at spatial visualization? It is important for students to become proficient in spatial reasoning for a few reasons. The first and foremost reason is because students will need this skill for the rest of their life. When doing these activities, I could only think about the time that my husband and I were looking at houses. When I was considering which house to by I was thinking of furniture placement the whole time. This is a concept of spatial reasoning. Also, students will need this skill to plan activities and for some jobs later in their life. At what grade level do you believe students are ready for visual/spatial activities? How can we help students become more proficient in this area? I think at any grade level students can start working with visual and spatial activities. Each grade level will have a different level of proficiency that can be mastered. 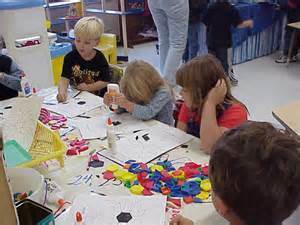 There are less challenging activities that students in grades such as kindergarten can achieve like designing buildings. This will help them become familiar with spatial. We can help students become proficient by providing them with an adequate amount of activities that relate to visual and spatial concepts. ******Were any of these activities a challenge for you? Instead of visiting a toy store, I simply took a walk down Wal-Mart’s game isle. I was very amazed to find so many games that were using geometry. 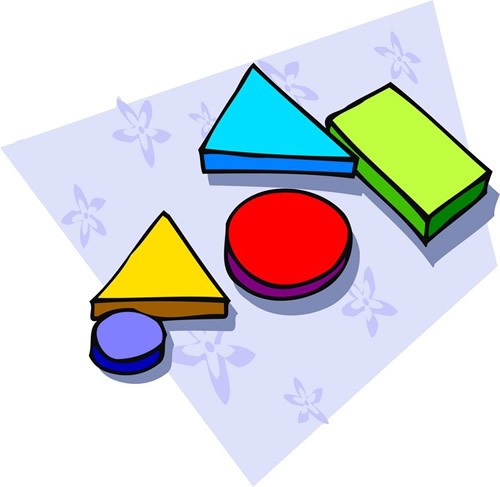 In realty, children are using shapes for most games and are moving their players along squares. Students are learning that as they move their player then becomes “blank” squares away from winning. In a sense this is similar to area concepts and how many spaces they are away. Also, in games such as scrabble we are seeing different pentominoes without even realizing it. Games such as this could be used during math rounds or indoor recess. I can truly say that tangrams are a little challenging for those who have to process information. I found that I spent a large amount of time mixing around my tangrams even to create my first square. It is a challenge to use all the pieces as well for making shapes from other shapes. Sometimes I saw a shape with only using some of the tangrams rather than all that were given. 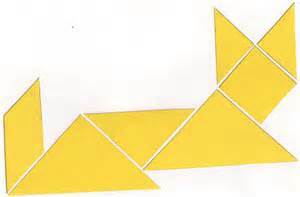 I think before teaching with tangrams, students should have the opportunity to explore with them and figure out how they would and what they are used for. Even kindergarteners could make silly pictures from tangrams to begin understanding their use.